So, after last week and the mini album I made, I'm kind of tapped on mojo. But I really wanted to play along with some VSN challenges for the mini yesterday. If you didn't get a chance to play along, you still have until tomorrow (Monday) to submit your creations! My first card is for Jenn Buck's challenge. The challenge was so be inspired by the beautiful flowers on the Bellagio Casino ceiling. And to use a transparency on your card. This is the ONLY transparency I have. You might remember it from last time I had to do a clear card challenge. 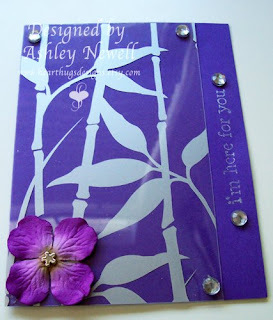 I just stamped a sentiment from Unity's Aug KOTM, added some bling, and a flower with a brad. Super simple but like I said, I don't have a lot left in me after last week. 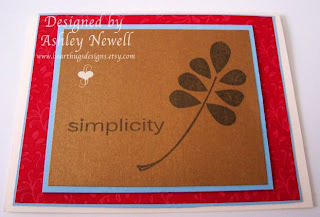 The next card I made is for my good pal Sherry Campbell's challenge. She asked us to be inspired by the colors of the Venetian Hotel. Now, the Venetian is one of my favorites since it has a gondola ride that runs through it and the whole thing looks like Italy. It's a very pretty hotel. The colors Sherry had us use are burgundy, gold/yellow, blue, and white/cream. Again, tapped for mojo, I went super simple. This is Unity's Gratitude = Joy stamp set. I just layered paper. Anyhow, the next VSN mini will take place in April. I hope you will join us. It's just a fun day of chatting on the SCS forums, lots of challenges, making new friends, and you can even get chances to win prizes. I LOVE VSN! What a great challenge! and you did very good with these wonderful card! I loving the Venetian-inspired card. I love that hotel/casino! The colors on that card does remind of it. The blue is so warm and inviting! And I love "simple" cards. Which to me is always a understatement! Beautiful cards! They're both awesome!!! Love that deep rich blue and what a fun touch the transparency adds! Love em Ashley! Looking forward to your guest design work for Pez A Doodle! Congrats!